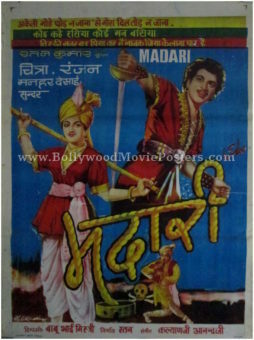 Old Bollywood poster for sale of the Hindi film, Madari (1959). This is an actual surviving vintage Bollywood poster for sale of the 1959 Hindi film that was directed by the pioneer of special effects in Indian cinema, Babubhai Mistry. Madari starred Ranjan, Chitra, Sunder and Manher Desai in prominent roles. This vintage Bollywood poster was designed and printed for publicity of the film a few years after its original first release (somewhere in the 1960s). This old Bollywood poster for sale was originally designed in hand painted oil on canvas format by a poster art studio in Delhi. Quirky hand drawn artwork that is typical of vintage Bollywood design is seen in this old movie poster for sale. Set against a blue background, the poster features a snake charmer and a skull at the bottom, giving away the fantasy plot of the film. Lyrics from popular songs in the film find mention on the top of this hand drawn Bollywood poster.